Six men who, as teenagers, braved the British to blow the shofar at the Western Wall on Yom Kippur decades ago, gather for a remarkable reunion. As Yom Kippur approaches, memories of the dramatic, climactic, and British-banned shofar blasts at the Western Wall under the British Mandate come to the fore. Six men who, as teenagers, braved the British bobbies and blew the ram’s horn at the Wall, and who even sat in prison for their efforts, gathered recently for a remarkable reunion at the Western Wall itself to discuss their memories. Under the British Mandate, the Western Wall prayer area was only some 13 feet wide, and was used by local Arabs as a pedestrian thoroughfare. Jews were allowed to hold some prayer services there, but at times sitting was not allowed, and shofar-blowing was certainly a non-starter. The shofar is blown in Jewish tradition on three occasions nowadays: At morning services during the month preceding Rosh HaShanah, on Rosh HaShanah itself in fulfillment of a Biblical commandment, and to mark the end of the Yom Kippur prayers and fast. The Yom Kippur shofar blasts at the Wall took on special significance under the British Mandate. While the shofar could be sounded elsewhere on the other occasions, Yom Kippur worshipers at the Wall refused to surrender their right to audibly mark the passage from the solemnity of the Day of Atonement to the joyous days of forgiveness and preparing for the Festival of Sukkot. Shofars were smuggled in each year from 1931 until 1947, and brave teenagers belted out several blasts before running away; some were caught – and jailed for up to six months. Their experiences of then and now are recounted in a new video produced by the Toldot Yisrael (Chronicles of Israel) association. Toldot Yisrael is a Jerusalem-based nonprofit organization dedicated to recording and sharing the first-hand testimonies of the men and women who helped found and build the State of Israel. 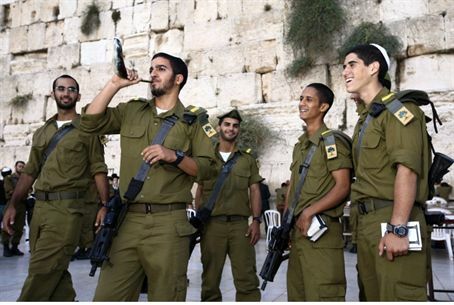 Its current video features the six brave Western Wall Yom Kippur shofar-blowers. The producers of the movie say that the only shofar-blowers who are still alive are Yaakov Sheretzki, who blew the ram’s horn at the Wall on Yom Kippur of 1943 at the age of 18; Avraham Elkayam, in 1947, when he was aged 13; Avraham Kaspi, who was aged 16, in 1946; Mordechai Shechori, aged 21, in 1942; Yaakov Aharoni, aged 16, in 1938; Moshe Karavani, aged 13, in 1946; and Ephraim Steinberg, aged 15, in 1946. They gathered at the Wall to tell their stories of how they jumped at the opportunity to blow the shofar, how they actually did so under the British noses - and then tried to run away. They also recounted what the experience meant to them throughout their lives. All the stories bear repeating – the video is certainly worth watching - but the following can certainly not be overlooked. Elkayam said that during the Six Day War, immediately after the liberation of the Old City, he went with several of his comrades to the Western Wall. He said he saw someone there with a shofar, and felt the urge to blast out a few tekiot. When he finished, someone approached him and said, “I see that you have a special connection with this shofar. Can you tell me about it?” Elkayam said, “I was the last person to blow the shofar here in 1947.” The man, who was none other than the famous Moshe Segal, answered, “And I was the first one to blow it, on Yom Kippur in 1931!” – and the two embraced.